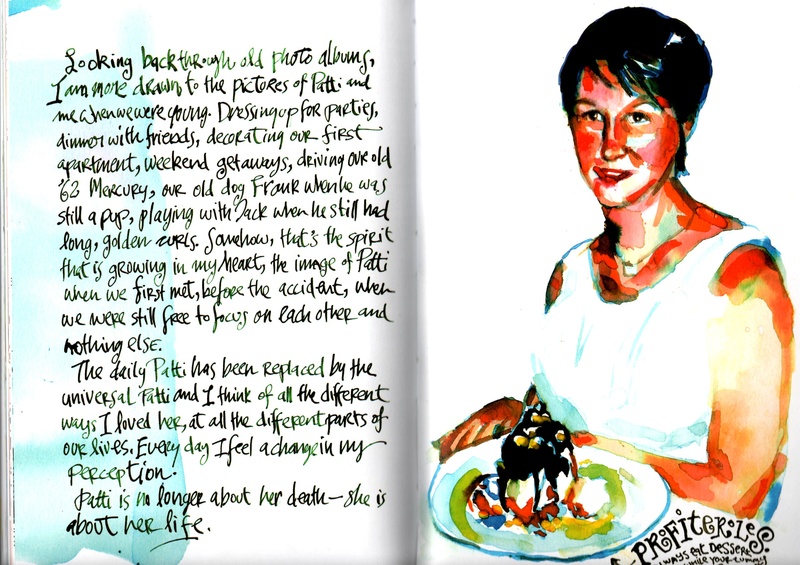 A few years ago I came across a book on procrastination entitled A Perfect Mess. 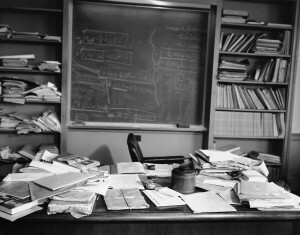 It was a good book, which talked about how for many e-creative types and thinkers a desk that looks like the one below is actually organized chaos to the creative thinker and hell to the organized structured individual. The desk in the above image actually belonged to the scientist Einstein. It doesn’t look too dissimilar to the desk I am working from at the moment. Well I don’t really work from my desk because I can’t get to my desk. But I have noticed that for the last ten days I’ve had to leave the messy desk and just focus my energy and attention on the work that needed to get done. It’s a miracle that the laptop is mobile so I can literally find clear spaces in my home to relocate to and work from. I’m aware though that any thoughts or images that occur in my head about my desk even when I am nowhere near it instantly drains my energy but so does the long list of items to be completed on my to do list. In coaching we refer to physical objects in this condition as tolerations. I’m also noticing how my desktop on my laptop seems to be mirroring what the messy desk looks like in physical reality. Not good I say to myself. The challenge right now is should I clear the desk as a matter of priority? This will take several attempts before a real shift is experienced and involve several hours of work on my part. Or should I just continue being productive and creative and ignore the mess as much as I can until I can find the space and time to clear? These are the questions I am faced with on a weekly and even more often daily basis. And I choose to respond differently at different times. This week definitely feels like it will be time to clear the desk, create order and file things away. But next week may see a rapid return to the perfect mess. It’s like a dance some days it’s the tango and other days it’s the waltz. 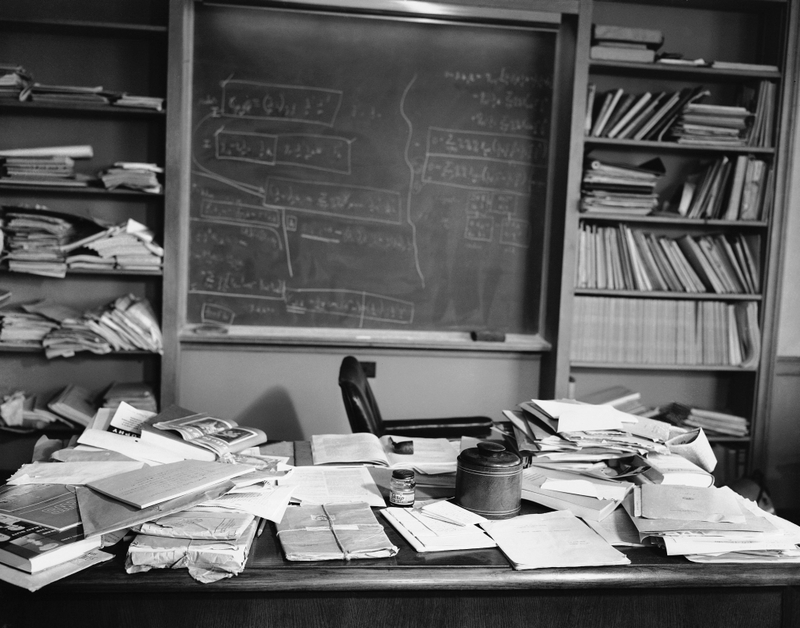 I feel better today for seeing this image of Einstein’s desk. Maybe he too recognized that there are days when it’s more important to just get on with it and ignore the mess. I think there’s something exciting and alluring about mess and something calming and affirming about order. I can’t seem to choose between the two? What’s your working environment like right now and how is it helping or hindering your productivity, writing or creativity right now? 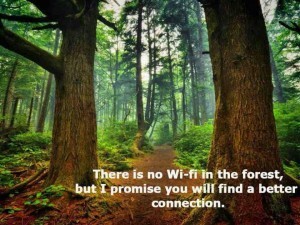 This Monday morning how will you find a better connection away from Wi-Fi? Make A Complete And Utter Fool Of Yourself where she talks about change and the creative process. She shares the steps outlining how she navigated a big change and shift in her own working life and personal life which I could really resonate with. How have you navigated a big change in your personal or working life? Starting a new year can often bring about new and exciting goals. Your intentions are well placed, but if you’re someone that easily loses sight of their goals because the reality of life sits heavily on your shoulders and you cannot see the light at the end of the tunnel; slipping back into old habits of procrastination can often feel like a comfy pair of slippers. I don’t know about you, but I love the changing seasons and although we may be experiencing the Winter months right now; it’s only a matter of weeks before Spring is upon us so what better time to prepare for the blossoming season by focusing on improving our healthstyle – mind, body and soul. Tell us who you are and what you do as a profession? I work as an Executive Coach delivering one to one coaching in the further education sectors to mangers and senior leaders, as well as delivering an accredited coach training programme to them too. Another part of my job is to work across the different sectors and the creative industries, in which I deliver different types of leadership and management training. In this profession, I get to speak at conferences, lead retreats and all kinds of other interesting things, such as teaching creative writing. 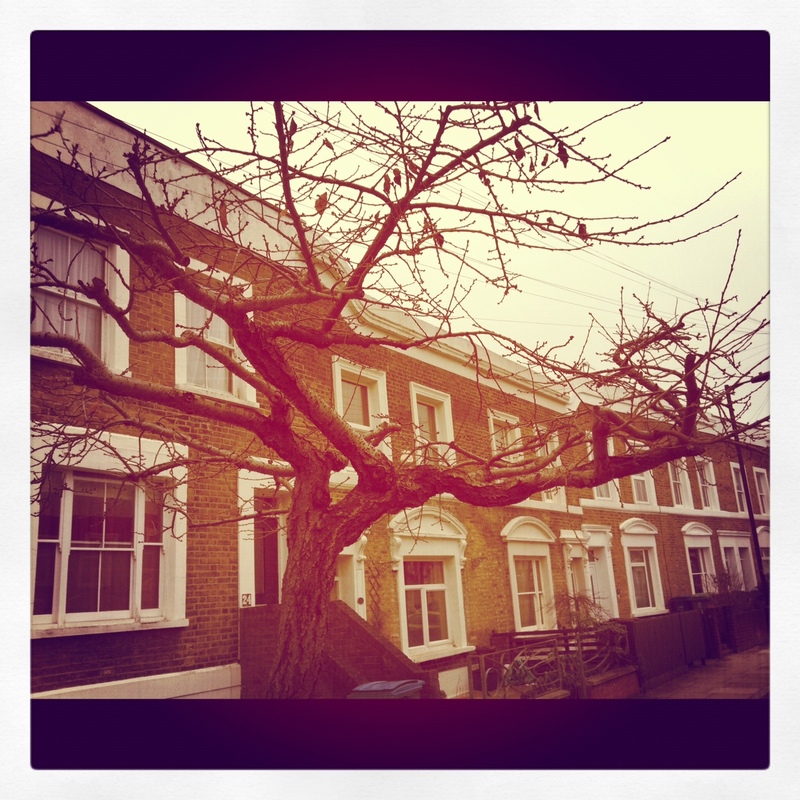 I run a practice that allows me to nurture inspiring writers and creatives. I am particularly passionate about this side of my work because this source of inspiration and creatively keeps me well resourced and energized for my corporate work, which can be demanding and stretching at times depending on the kind of organization I am working with. I’m the author of three books, ‘Soul Purpose’, ‘Be Your Own Best Life Coach’ and ’49 ways To Write Yourself Well’. In addition, I have authored numerous workbooks and e-books, which are slowly getting birthed in new formats on my website. Because I have gained so much encouragement and vitality from other people’s writing, blogs, personal experiences that just simply make my heart sing, I felt I wanted to create a community of my own, so I am establishing an online community where individuals can be creatively watered and fed. For those of us who are unclear of what your job entails, can you elaborate on what a ‘Life Coach’ does? Well, I am less of a Life Coach than I used to be and that is because the majority of my coaching takes place in corporate environments. Life Coaching is where I began coaching. A Life Coach works on general life areas with an individual, helping them to shift behaviours, attitudes or beliefs so that a specific goal or objective can be achieved. So, as a Life Coach I could work with an individual on relationships, time management, career, writing or creativity and their well-being. The areas can be quite vast. But generally I found that people contacted me when they were either emotionally feeling stuck, had experienced a life crisis, experiencing a challenging relationship or they wanted to write or do something similar to what I was doing. Over the years I have worked with some challenging situations, some very public and some very private but always I watched as no matter how difficult the situation the individual was experiencing, they would begin to make sense of what they were going through. Typically I would work with an individual for an agreed number of sessions say 6 x 1 hour sessions. We would agree from the start the areas they wish to focus on and what their expected outcomes would be. Sometimes it would soon become apparent that these weren’t the real issues and we would find ourselves diverting towards the real underlying issues. My clients tell me I am a good listener. I’m not so good a listener with my family and friends, however, when I am coaching it’s like I access a different deeper part of myself that shifts the quality of my presence and ability to just be. I would like this to be more congruent in all areas of my life but I realize that I won’t reach that ideal of perfection and I am more willing to give myself permission to be human. I’ve received a lot of coaching myself and had some amazing experiences and shifts too so I know intuitively what works best for me. It’s not all the fancy techniques and tools very often for me it’s real conversations where I feel heard and seen that allows real transformation and learning to take place. What, if any, put you on the path that you are on today? Where would you like me to start? Some of my early childhood experiences forced me to confront some difficult life experiences that I knew once I had gotten into my teens that I needed to make sense of. I grew up in a family of six children and we were not all without our faults or our challenges. But I knew from an early age that I had a wise head on me. I was genuinely interested in people and I was keen to learn. When I finished university I became a youth worker and it was like the heavens had opened and I found my calling. In this one profession I could write, I could train people, I could facilitate and run groups, I could be creative, I could talk and be with people. I could think and share my opinions plus go on really great training courses. I felt I was in a sweet shop with so many goodies. It was one of the best times of my life. An opportunity to receive coaching as part of my development back in the 80’s put me on track although it took years for me to fully embrace to become a coach but the foundations were laid back in those early days of working in Hackney. I also had a lot of people input into my life who made a difference and I guess I modelled myself on many of my mentors who helped to shape and mould me. I had a lot of hang ups due to my upbringing so even though I was a fighter and someone who achieved a lot I had a lot of stuff to work through and needed the input of others. I guess much of that valuable input made a lasting impact and I wanted to contribute to others in a similar way. Would you say that your work only caters for a minority of people? I find that coaching has become very pigeon holed. It is pricing many people out and I am an advocate of making coaching accessible and not elitist as it is in many circles. So, by keeping coaching in pockets ensures that the elitism continues. I strongly believe that coaching should be a communication tool that is made available to everyone. It would not be devastating to me if coaches were done out of their profession as a result of the whole coaching process becoming more readily available to anyone needing it, that would be a good thing because I believe work places would be much better environments to work in with an embedded coaching culture and approach. In turn, relationships and communities could benefit too. I find that I bring coaching into every area of my work whether I am running a coach training programme or a writer’s retreat. The skills are transferable in almost every area of life and work. So, I come to you as a potential client with a need to unblock my creative mind, how would you help me with this? We would explore and we would experiment by trying things out. This would take place in and outside of the session. One of the experiments would involve some writing, drawing and making a collage. I would invite you to share about your childhood and times when you were creative and absorbed in doing things. I would be on the lookout as I listened to any creative blocks and looking to find out about when they first developed. There is no easy answer to this question. Each individual is unique and different. In one session with a Vice Principal of a big inner city college I shared my love of walking and that led me to finding out a big creative block he had for over ten years around being a painter. He had stopped painting when he entered academia. He had a painting studio in his home that had remained locked for ten years. Our work together explored his reconnection with his creativity and painting. I am not a formulaic coach. I wish I could be more like that sometimes as some coaches are good at taking their experiences and packaging them into steps and e-course etc. but that is really not my strength. My daughter Aida is a huge inspiration to me. She’s 23 and living and working in Dubai, she is seeing the world. She is such a loving, joyous child that if she wasn’t my daughter I would love her as a God-daughter or a younger friend. I see a lot of myself in her but she seems to have got a lot more positives all round. We look a lot like each other and sound like each other and we can laugh and hangout with each other no problem. The other inspiration to me is my 80 year old Mum. My Mum and I had a difficult relationship growing up. Neither of us really understood each other. I was always rebelling, resisting and being a bit of a pain. But getting older I have really come to appreciate my Mum as a person and learnt a great deal about what she has had to deal with, overcome and come through. Now I see and appreciate her so differently from the young Jackee growing up. 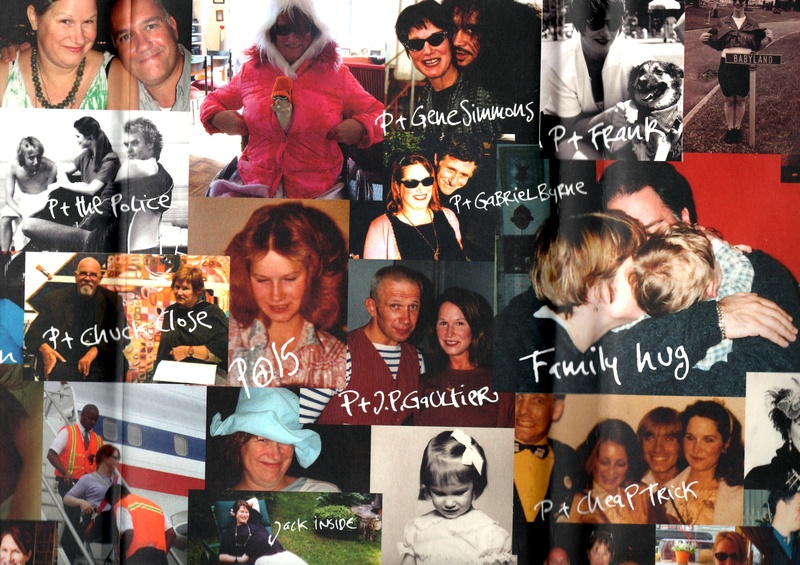 Raising six children, having a nervous breakdown, recovering, her resilience – amazing. She was astute with money and still is and made ends meet always. Us kids were always dressed in the best clothing. She had a great eye for style another quality we have all inherited from her and my Dad. But most of all I woke up recently to realize just how humorous and funny my Mum is. Again another characteristic I had overlooked. Each of her children have inherited a bit of our mum’s humour and witty side of her. Do you have any Seminars or Workshops coming up for anyone needing help to kick-start the New Year? I’m doing a Writing With The Senses One Day Retreat in Kent on Saturday May 18. 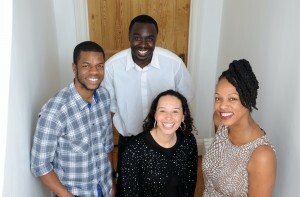 See our website for further details: www.jackeeholder.com I’m also speaking at the conference for Black therapists on the 27 April 2013 on the theme of Self Care. Would you say you have your work/life balance as you want it to be? I retreat back to Barbados every August without fail with my family. I take time off on all the holidays and bank holidays and many weekends will begin to become a mini holiday. I travel quite a bit with my work so will build in downtime if I am staying over night in a different place other than London. I invest quite a bit in training, my own training and find those dates and times therapeutic and a time to refuel. I’m very social and we have lots of dinner and garden parties and celebrate birthdays by getting people round. 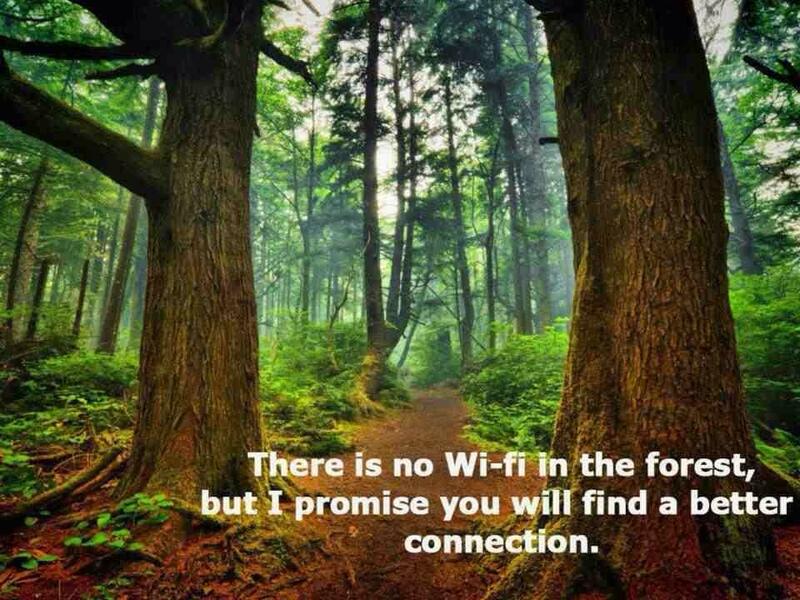 I love getting out and being with nature to recharge my battery. It’s the beginning of 2013 and someone wanting to reach their personal goals for this year, what tips do you have to share? Write them down in a notebook or a journal. Research has shown that most people achieve their goals when they’re written down than when they’re not. Connect with someone who is further along the road in achieving a goal similar to yours. Find out what got them there, get tips, make a connection. Join a Mastermind group with other like-minded people where you can have monthly check-in’s and talk about your progress. Think of positive, achieving people to invite into your circle. It needs be no more than three other people. Your Mastermind group can hold you accountable. Or if a Mastermind group doesn’t feel right consider finding yourself a mentor. If you have a goal just get on with working towards it. Sometimes talking about it dispels a lot of your energy. That’s the real ‘ying’ and ‘yang’ of goal setting. Sometimes it’s good to talk and sometimes you just need to get on and do it. Cultivate a spiritual or mindful practice. Some kind of practice where you still your mind and know that whatever the outcome of your goals, you’ll be okay. I’ve had my fair share of mentors and mentees in my life. But in this blog post I share a personal account of a special mentoring relationship that has lasted over eighteen years with three young people (Camile Curtis Y Van Dyke, Tokunbo Ajasa-Oluwa and Kwadjo Dajan) I began mentoring at the BBC in 1991. What follows is a short history of our journey together. In 1991-1994 I worked at the BBC as the BBC Mentor Project as coordinator of an educational programme for young Black students from Hammersmith College a college local to the BBC centre at White City. It was an exciting time working on a project that pushed the boundaries. It was the perfect post for me bringing together my earlier background and training as a Youth and community worker as well as my growing experience in training and development. 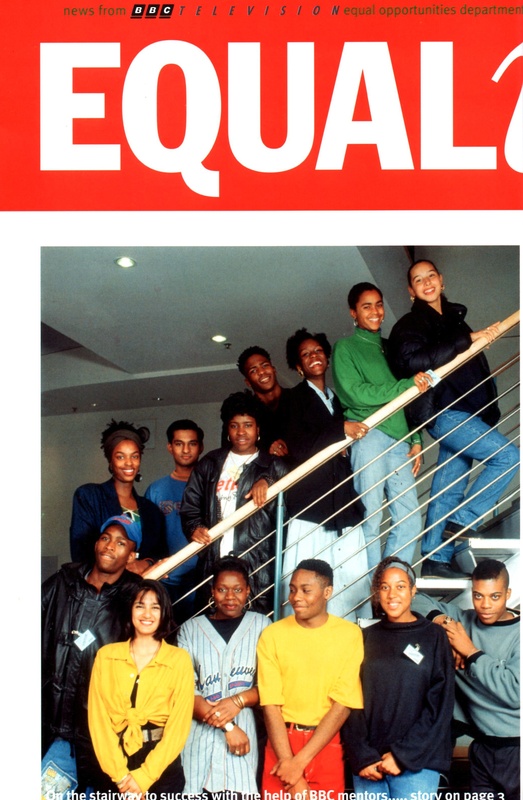 The scheme matched 12 young people between the ages of 16-17 with Black mentors across the BBC ranging from presenters, producers, technicians and cameramen. Providing one to one mentorship and shadowing from mentors along with a personal development programme the scheme aimed to increase the confidence of young black people to consider careers in the media and the BBC where Black and ethnic minority staff were significantly underrepresented. It was an incredible pool of raw talent. I could feel and taste that talent during the interview stage. Many were turned away who fitted the bill than we had space for and the majority who were recruited onto the programme have gone on to create good and successful careers and lives in so many ways. I am deeply proud of all of the students that participated on the programmes during my time with the BBC. Three particular students stood out for me, firstly Camille Curtis Y Van Dyke who was a member of our first cohort and then secondly best friends Kwadjo Dajan and Tokunbo Ajasa -Oluwa. Each stood out for a number of reasons. As a result of Camille’s influence and leadership on the first programme we created a post of Mentor Student co-coordinator, which, saw her acting as a student, liaison officer on our second programme. She immediately connected with Kwadjo and Tokunbo and Toks as we know him became the Mentor Student co-ordinator on the second programme. All three are incredibly close to this day. Each had an incredible charisma and demonstrated strong leadership skills on so many levels in their early days. They would be the one who would stay behind and talk through the programme with me, pitching ideas and making suggestions. Even though I was still in my early thirties I felt like the older big sister taking care of her younger siblings. I had no doubt that each would carve out a name for themselves in the world of work. I left the BBC in the third year of the programme but remained in contact with all three. We met once or twice a year for dinner where we spend the whole evening taking turns sharing the twist and turns of our lives and sharing our visions and dreams for our work and careers. We would creatively brainstorm around project and ideas and offer each other the necessary support and guidance. We were also truth tellers with each other. Feedback was always part of our conversations and we would tell each other like it is knowing which of us was best placed to go there. In-between our face to face catch up’s I would be a listening air on the phone and the one they would turn to when making some of the bigger decisions in their lives. But over time our roles reversed and increasingly they became champions of my work, suggesting and guiding me with their different views and perspectives. It was a refreshing and much welcomed change of role and I loved growing into the new space with each of them. It was inevitable that they became a part of my personal and family life attending my graduation ceremony as an Interfaith Minister and significant family events. They watched my daughter Aida whom they have known from the age of three grow up from being a child into a teenager and this is where they each became more involved in her life first as supporting friends and then each easing into the role as her own personal mentor. When at sixteen she needed work experience Kwadjo stepped in through his work as a producer at ITV and Channel Four and set up for her to shadow him. She also took part in a round table discussion between a group of young people and award winner theatre writer and actor Kwame Kwei-Armah. The very networking the BBC had wanted to nurture in the industry was now happening in my own back yard. 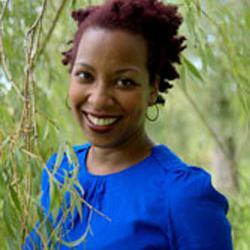 Camille Curtis Y Van Dyke has built a great and valuable career working with young people and nurturing their art and creative talents as the Social Inclusion Project Co-coordinator at WAC Performing Arts and Media College based in Haverstock Hill in North London. She is a manager and leader who leaves no stones unturned, will and does go that extra mile and has made a real and significant difference to the lives of young people she works with. She is full of get up and go, she’s bold and courageous and is one for making things happen. She has two brilliant children of her own and has grown into an amazing woman whom I completely adore and who is always completely affirming of our relationship. She has lost none of her charm as a young woman or her humour and wit. Whenever I hear her voice on my voice mail or meet with her in person she lights up my day. I love her to bits and she feels like a daughter I could have had. Tokunbo Ajasa-Oluwa left the BBC Mentor project and co-founded the Origins rites of passage programme for young men of African Caribbean descent, which still operates today. He went on to peruse his love of journalism eventually establishing his own online magazine for young people Catch 22 a dynamic social enterprise that engaged, trained and championed excluded young media talent. He is an amazing creative and strategic force and is now Head of O2 and Bauer Media’s Go ThinkBig that supports the career aspirations of the under 25’s in the UK. Kwadjo Dajan has solidly earned his stripes in the world of investigative journalism honing his skills in the media and with his mentors from the days of the BBC Mentor Project. He’s one of the UK’s youngest and rising, most respected investigative journalists whose worked as producer and director on television shows like Airport, Airline and the more recent Mrs Biggs. He has a gift for sniffing out stories and gets people to open up to him and share their stories when others have been unable to do so. He has amazing rapport and an ability to get people to place their trust in him at a drop of a hat. He would definitely not like me saying that about him. He is the most humble and gracious human being. His career achieved a recent national and global peak when in 2012 he was awarded the BAFTA Break Through Talent Award for his award winning television programme, Appropriate Adults, a factual drama telling the story of Gloucester housewife Janet Leach, who helped solve the crimes of Fred and Rosemary West. Kwadjo is responsible for the video clip on the front page of my website. All three are outstanding and stunning individuals whom I feel honoured to have as a part of my life so much so that in 2003 when Aida turned 18 I decided to appoint her a new set of Godparents to guide her through the passage of young adulthood. We held a ceremony where twenty friends and family members gathered to witness the new Godparents being sworn in. 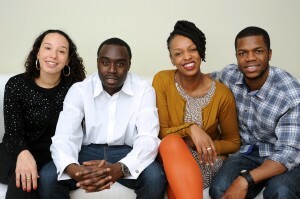 Kwadjo and Tokunbo were amongst the newly appointed Godparents and Camille was formally appointed as Godparent in 2011. Each has taken their role seriously and have nurtured independent relationships with Aida outside of their relationships with me. Each brings something different and unique to the table in their engagement with Aida. Camille keeps it real and reminds Aida to have fun and stretch those boundaries in life. Kwadjo is a strong grounding force of common sense and keeping your feet on the ground. Toks (as he is known to us) straddles between the two offering creative and emotional perspectives that remind Aida that we’re all human and nudges towards that creative spark. I have no doubt that the mentorship baton has been now passed on. None of us have been without our ups and downs, relationships and careers have come and gone but we have stayed together providing a strong current of support and encouragement for finding our sweet spot and being our authentic selves in the world. I can honestly say that I have learnt an incredible amount from all three. Our relationships remind me that in the dynamic of any mentoring relationship there is learning for both mentor and mentee and at some times if we allow it to the tables change and we enter into a flow of learning that sees roles and titles fade away as unique relationships develop between individuals. In 2013 I consider all three my peers, no longer the younger ones. Who knows as I grow in years maybe now the tables will turn and I will seek out their mentorship and advice as my business moves in new and different directions. I hope so. In the next few blog posts Camille, Tokunbo, Kwadjo and Aida get to share their perspective on our relationships over the last 18 years. On the first day of training internal coaches we focus on the cultivation of Mindfulness. The Eastern traditions and teachings of Zen Buddhism are steeped in the ways and practices of Mindfulness that offer coaches a range of ways to prepare for coaching in a way that brings present awareness to the coaching. One of the early exercises we engage coaches in is to invite coaches to consider the ways in which they empty the mind of clutter and distractions on a daily basis and make what I call the Switch. 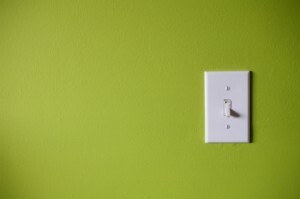 The switch is where you make the transition from Busy Mind to Quiet Mind. It’s the practice of preparing for coaching sessions where the coach consciously reduces as much interference and distractions from the mind which will allow them to be as fully present and available in the session as they can possibly be. For many of the internal coaches we work with this is not an easy task. Many are working overloaded schedules and timetables. Most never have time for a lunch break to eat properly let alone digest their food and alone slow down. Many wake up and the first thing they do is reach or the mobile or lap tops to check incoming emails before they’ve even had a chance to breathe into the day. Don’t worry I’ve found myself caught up in this cycle myself and have had to work hard at reprogramming myself constantly to do my meditation first, or to take several deep breaths which I really enjoy doing or going straight to my notebook for a meditative writing practice of Morning pages or free writing. When I put any of these practices at the front of the day I always enter into the days work differently and in a better frame of mind. I also incorporate the same practices to help me make the switch as I coach individuals throughout the week. This question of making the switch is an important one for without a conscious cultivation of emptying the mind coaches are in danger of surface level conversations, mediocre use of coaching tools and techniques and poor quality of relationships with coaches. Making the switch holds many benefits and gains for the coaching process. Switching creates more spaciousness for quality observation. It improves the degrees of attention to non-verbal cues and intuitive intelligence, enables connections to sensory data to be more readily accessible and promotes better quality thinking both creatively and intellectually. By making the switch an integral part of your own coaching practice you’re best positioned to model this with your coaching clients and share the differences this will make for levels of satisfaction and productivity. With busy schedules and demands coaches can be creative in finding ways of making that switch that are easy and doable. One way to begin this practice is by listing what you could do in a 15 minute period before a coaching session that would help you make the switch from busy mind to quiet mind. Next write what you will do into your diary. Writing it down does make a difference. You’re more likely to carry out the switch when you write it down. What could you do within a 15-minute window of time that would help you make the switch from Busy Mind to Quiet Mind? What is your experience of your coaching when you make time to consciously switch from busy mind to quiet mind? What are the most common reasons that get in the way of you making the switch? What is the switch practice you most enjoy? What switch practice will you start with? Here I am with Sanctuary in 2009. In early 2000 I was a dedicated early morning runner, well actually more of a jogger. I would get up at 5am jump into my running gear and head out the door full of energy. 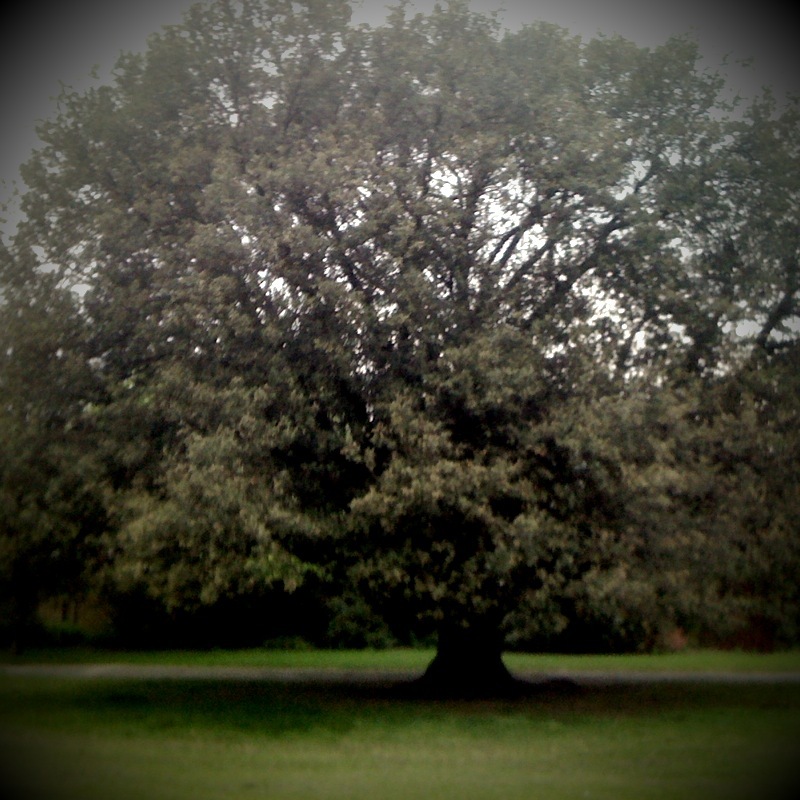 On the days when I ran around my local park I would finish off my run by taking time out under the comfort and shade of a huge sprawling Evergreen Oak which stood at the top of the park’s highest point. The tree is unique as it never sheds its leaves and so holds a resplendent crown of leaves all year round. It is stout with muscular branches stretching through the air mirrored by roots below almost as thick burrowing underground occasionally raising up above ground, high enough above the soil to provide you with comfortable seating. The space underneath the trees branches are wide enough to house over fifty people comfortably. If it rains you’re guaranteed to remain dry as a bone under the trees shade. Once I visited Sanctuary almost every week for an entire year. It was a dark and dismal time in my life when I was truly broken open. 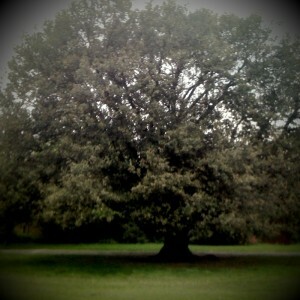 But Sanctuary the name I eventually give the tree was the one calming and grounding influence in my life. She was both the daily faithful witness watching over me and the silent listener. She threw no judgments my way and gave unconditionally. Even today when I visualize Sanctuary in my mind I feel a warm glow inside the kind one feels when visiting a dear old friend from far away. 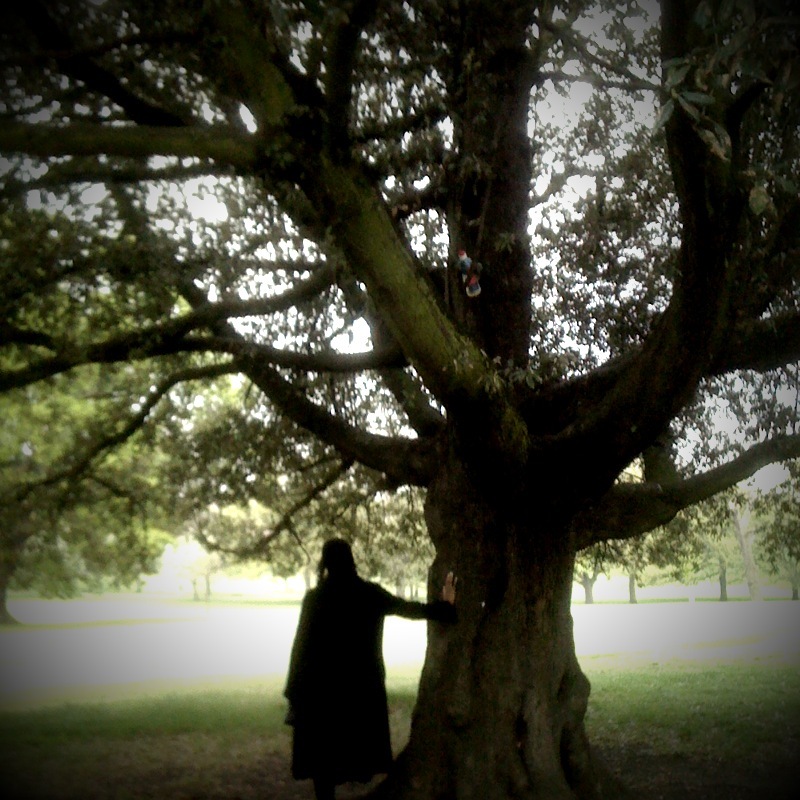 Though we don’t meet often I do consider this tree an old friend from far away who is full of wisdom and in whose presence I find myself returning home to myself. I know that on days when I am feeling overwhelmed or maxed out that even a quick visit to Sanctuary or one of her tree cousins closest to where I now live will ground and center me. 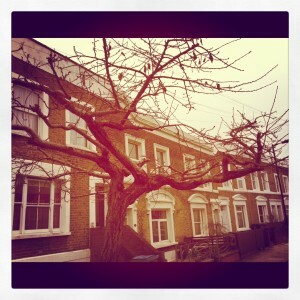 Remembering my early mornings with Sanctuary remind me of how far I’ve come and how much has changed since that time. I can look back to that time in my life and see what seeds planted over thirteen years ago have sprouted and blossomed and most of all I know the strength of my own resilience, knowing that whatever life sends me like this tree I am capable of weathering the storm. 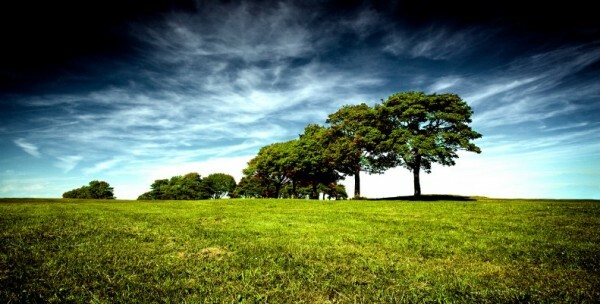 Do you have a special place in nature that has meaning for you? 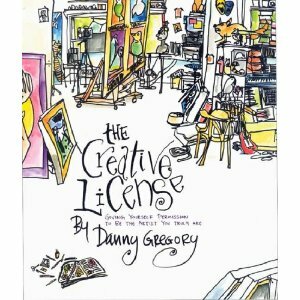 I’ve always received great value from Danny Gregory’s books on creativity, drawing and writing. 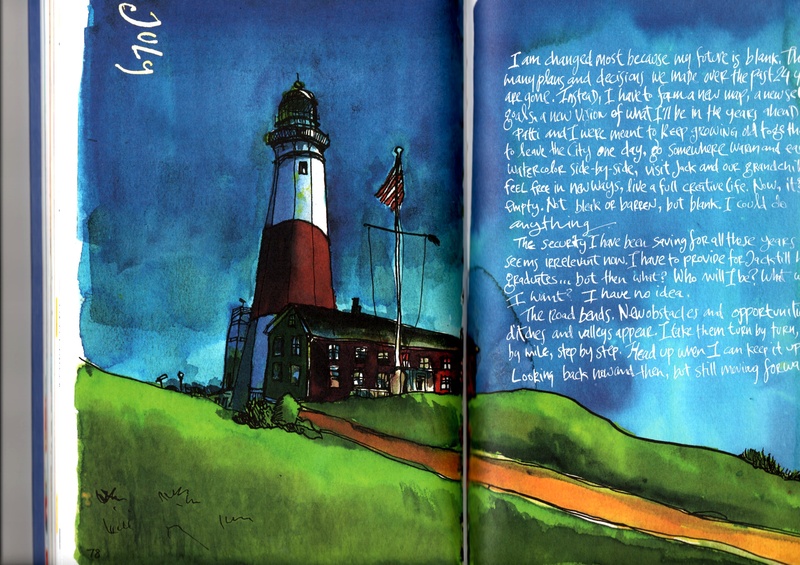 His books are a sensual, kaleidoscope of colour, sketches and insights into writing and creativity. I was always particularly taken in by the handwriting script, which are the fonts all of his books are published in. Being a handwriting fanatic this alone is enough to have me hooked. One of his titles, The Creative License is never far from reach. Since reading it over six years ago I’ve re-read it at least three times from cover to cover and have dipped in and out of it on numerous occasions, extracting quotes, refreshing my memory on the great content he shares about creativity and gathering ideas for writing activities. His book has helped me get unblocked several times over. Only last week on a one-day writing retreat I was teaching I used Danny’s lessons about drawing as a retreat exercise to really see and draw an object on the room we were working in. When I first read the book just a few pages in Gregory managed to convince me that I could draw (I hadn’t really drawn since secondary school) and I was happily sketching away in my notebook in no time at all. So imagine my delight last week whilst online by sheer chance I discovered that Gregory had published a new book. I’m the sort of person who writes down the date six months in advance when a writer whose work I love latest book will be published. The days leading up to it’s arrival feels like hot flushes and flutters of excitement and anticipation that surround a first date. I pressed click on the Wednesday and it arrived on the Thursday thanks to the super powers and might of Amazon. 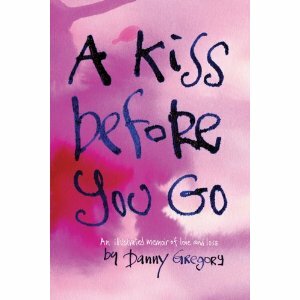 A Kiss Before You Go is part memoir, part non-fiction, and part lessons on creativity, hope and loss. 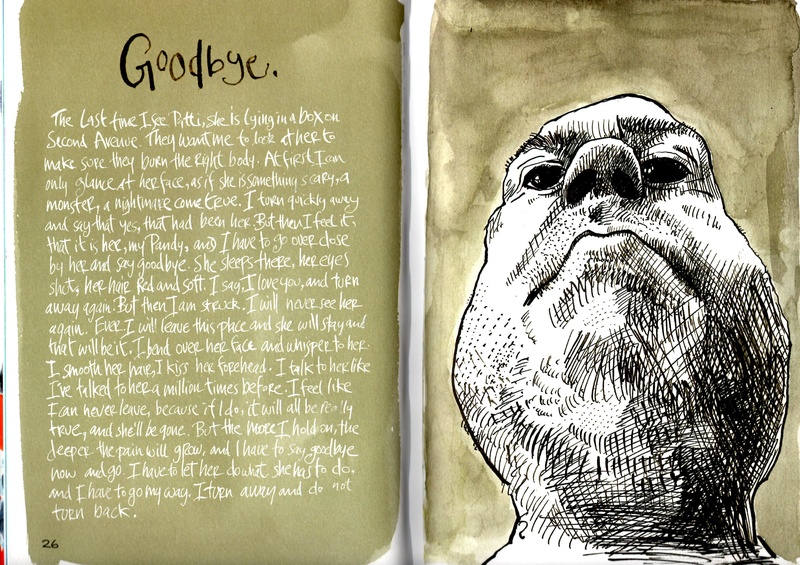 Gregory tells the heartbreaking story about the death of his former wife Patti. Reading it I am reminded that whenever someone recounts a tragedy that hope is never faraway. Hope waits in the shadows, waiting for the opportunity to take up residence just when one believes it doesn’t exist. This book and its contents are a timely reminder of this. Since the cause of death was not mentioned at the time of Patti’s death, Gregory writes as someone who has found peace with this great loss. You feel the emotions raw but not ragged. Worked through enough that you the reader are not sucked in by them. Meaning has been made making it a story that is tellable. Danny’s words are healing, open, wise and vulnerable what some would describe as medicine words. 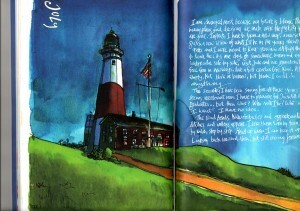 Writers and artists like Danny Gregory move and inspire me. They move me to create when I don’t feel like it. They motivate and galvanize me to keep on writing and through writing righting my own life by examining the interior self. Artists like Gregory remind me of why I am motivated to support others to feed and nourish their own creative hungers. He’s one of my writing mentors and his books would definitely accompany me on a trip to a desert island. Spare a moment to consider the many different ways you could close and wrap up your coaching sessions that has meaning. Reflecting back on the many endings I’ve had with clients the ones that seem to stick with clients were the ones where we didn’t just talk or write about the experience in order to evaluate it’s effectiveness but where they did something practical engaging the body where they could physically communicate their reflections of the coaching experience beyond the spoken or written word. One memory of a personal experience of an ending on a training course comes to mind. It was the final morning of a ten-week personal development course, which ran from the unusual times of 6am – 8.30am twice a week. On our final session we were requested to create a closing ceremony that expressed our experiences on the course. Rudy a budding actress invited us all to step outside for her ending onto the streets opposite Tower Bridge holding a bunch of multi-coloured balloons. Before she let the bunch of balloons go Rudy shared what the course had done for her, a funny story about how she had arrived at deciding on the balloons ceremony and ending with telling us about each of her goals she’d summarized on each balloon which she was about to release into the vast London skyline. The memory of watching Rudy release her balloons into the early morning skyline and watching her balloons climb high above the clutches of the Tower of London is as fresh in my body and mind as if it were yesterday. But perhaps even more was the primal physicality of the moment, the body and emotional shifts we watched Rudy go through as each Wish balloon was released into the air. The crisp, early morning London air, the hum of the morning traffic, the charcoal grey stone work of the Tower of London, the pale blue sky about to be set alight by the swatch of colour floating into her clutches. All of this brought the senses alive and engaged all of us fully in the moment. Years later I saw Rudy in an Indian restaurant in Greenwich. We had a lovely exchange and in a short space of time I learnt about how many of her wishes that had been etched across each of those balloons had manifested in the most wonderful ways in her life. Using physical activities by engaging the body often has greater impact than the traditional evaluation method coaches automatically switch to. There is the danger that the often routine habits of verbal and written evaluations provides feedback that is safe and is sometimes more reflective of what the coachee feels the coach wants to hear. But when you introduce activities that help consolidate the client experience of the coaching which is client focused then the outcome is often far more reaching and beneficial to the coachee. One way we can make this happen is to invite the coachee to consider how to make a good ending for themselves and this often requires thinking and acting outside of the box. Ceremony allows the learning from the experience to not just be thought about but to be felt in what could be described as an embodied way. Here are two examples of wrap up sessions that could be creatively incorporated as ending ceremonies with your coachee’s. Which of those themes feels like there has been a shift? What evidence supports this? Ask the coachee to specifically state what they are now able to release or let go of as a result of coaching? Invite the coachee to write one word describing what they’re now willing to let go of on each balloon. Alternatively have them write the issues down on a luggage or gift tag and tie this onto each balloon. 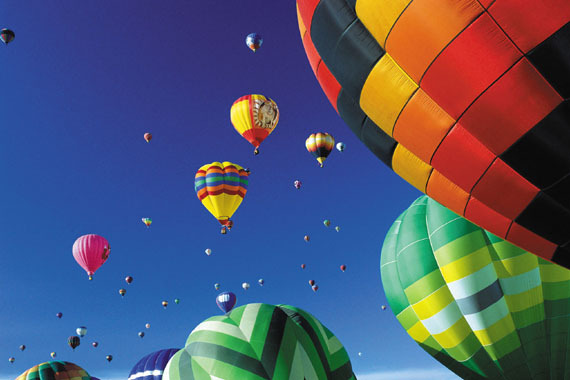 Find an outdoor space or window (please be mindful of health and safety) and release the balloons one by one into the air. Watch the balloons until they disappear. Follow the same steps but with this ceremony focus on what the new goals and aspirations are and write each goal separately on an individual balloon or luggage or gift tag and release in the same way. Not wanting to go outside try Michael Atavar’s suggestion and stick a pin in each balloon and make them go pop. Ask the coachee what three books would they take on a desert island that would support their ongoing personal and professional development? What other creative ways have you wrapped up your coaching sessions? 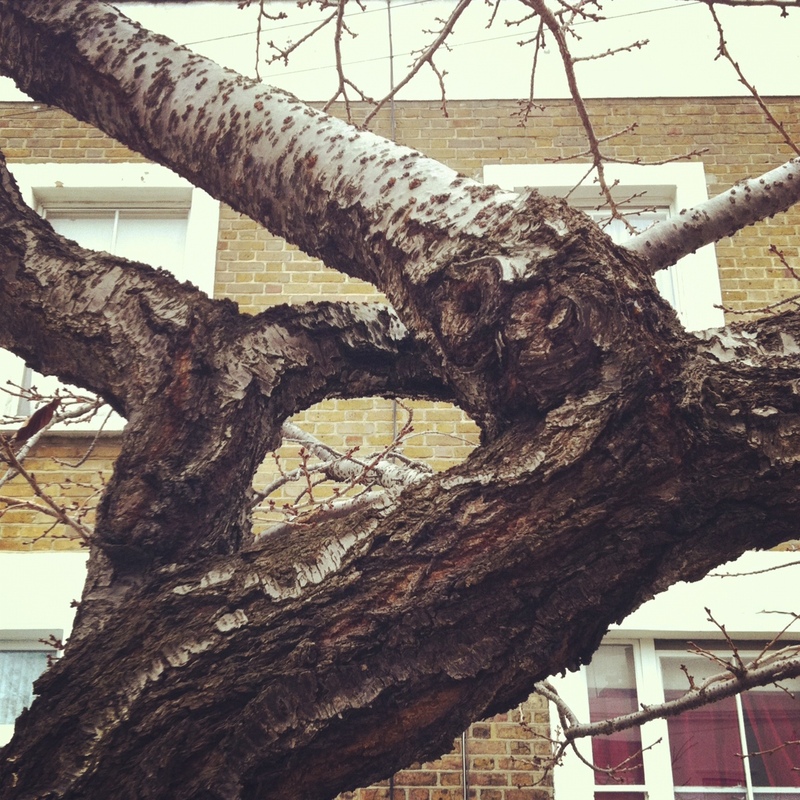 There are times when no amount of taking photographs of a tree will capture the sheer beauty of the tree that is seen when looking at the tree in person with the naked eye. Today driving past what looks like a Cherry Blossom tree or it could be a Birch I was struck by how even in it’s apparent nakedness the beauty of the tree managed to catch my eye on a grey, dismal Sunday afternoon. 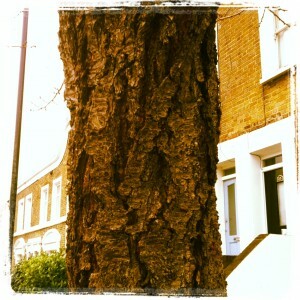 Its colours of muted browns, reds and oranges sparkled from the bark and some of its thick branches that I wanted to run my fingers over it’s crumpled skin. Sometimes life feels like there’s no goodness in it but unless we look close enough like I did today with this tree we will not see the pockets of dare I say beauty that may still be there. 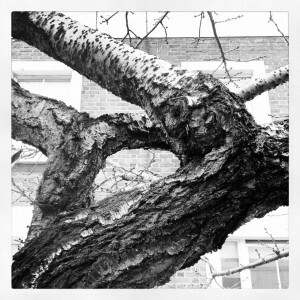 From a few yards this tree looked like an ordinary tree with nothing much to boast about, but on closer inspection revealed so much more, providing a feast for my eyes. Today take a moment to stop and write down five things that are good in your life no matter how small or insignificant they may seem. And on your travels this week why not stop and take a few minutes to really take in with fresh eyes a tree in your local area or your place of work.